Here is the legendary Kalashnikov Modernized Machine Gun designed by Michail Kalashnikov in 1968 and passed into the service of USSR Armed Forces in 1969. For a long time, this gun has become a benchmark of firepower and firing rate that combined huge ammunition with incredible mobility. Now, these weapons are available to laser tag players! 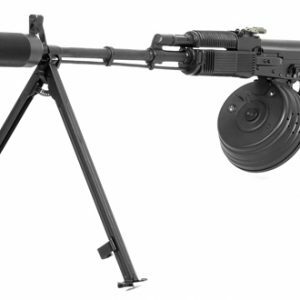 Based on an amazing quality airsoft body, this game set has a folding bipod and open sights. The body is made of metal with aluminum inserts. The power supply is a lithium battery with 2.2 Ah capacity, which allows up to 30 hours of playing without charging. Gun recharging is made with a bolt. The firing range is up to 1300 feet. The speaker is located inside the ammo box. On the battlefield, this tagger sounds like thunder. 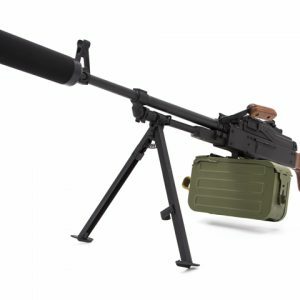 We recommend this model to fans of deafening gunfire and power!